Gates is the world's largest manufacturer of Timing Belts and Timing Component Kits at are equal to OE or better in service life & performance. Aramid reinforced nylon jackets and back side jackets for longer wear. High grade HNBR rubber for superior heat and contamination resistance. Premium high strength tensile members. Unlike some competitors, Gates does not substitute 'inferior' belt constructions for premium constructions specified by the OEM on any application. PowerGrip® GT®3 drives provide positive, trouble-free power transmission and offer many advantages over conventional chain, gear and other belt drives. The tooth design substantially improves stress distribution and allows extra high loading. The molded teeth enter and leave the sprocket grooves smoothly with negligible friction—functioning in much the same way as teeth on a gear. Fiberglass Tensile Member — Provides high strength, excellent flex life and high resistance to elongation. Neoprene® Backing — Strong Neoprene bonded to the tensile member for protection against grime, oil and moisture. 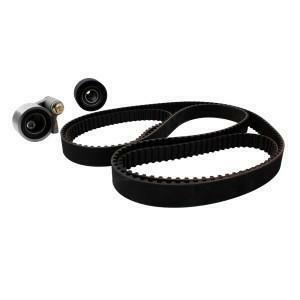 It also protects from frictional wear if idlers are used on the back of the belt. Neoprene Teeth — Shear-resistant Neoprene compound is molded integrally with the Neoprene backing. They are precisely formed and accurately spaced to assure smooth meshing with the sprocket grooves. Nylon Facing — Tough nylon fabric with a low coefficient of friction covers the wearing surfaces of the belt. It protects the tooth surfaces and provides a durable wearing surface for long service.